I thought this was a timely article from the Cyprus Weekly as the Cyprus Flamingo season is getting under way. 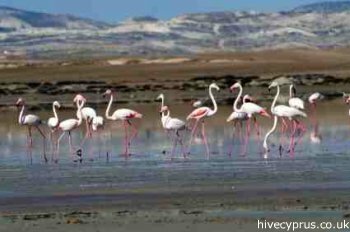 Cyprus’ recent downpour of rain may have seen a welcome increase in the number of flamingo visitors, but wildlife activists remain concerned that not enough is being done to preserve and maintain wetland habitats. According to statistics from the Games Services, Cyprus has seen an increase in the number of waterfowl migrating to the island in the last five years which includes the islands’ star attraction – the pink flamingo. The statistics are based on monthly recordings at Cyprus’ main wetlands such as dams and lakes. The flamingos gracing Cyprus every year are the Greater Flamingos or Phoenicopterus roseus, which are the most widespread species of the flamingo family. They are the largest species of flamingos, averaging 110 to 150cm tall and weighing two to four kilos. According to Nicos Kasinis, who is a game and wildlife officer, numbers were taken from the Akrotiri, Oroklini, Paralimni and Zakaki lakes as well as the various dams such as Asprokremmos, Alassa and Kalavassos among others. The research also includes end-of-year counts at all of Cyprus’ wetlands. Last month, a total of 8,054 different waterfowl – including flamingos and ducks – were recorded throughout the island. The number of flamingos counted reached around 3,500 with more than half cited in Akrotiri. Unlike other birds, flamingos don’t have any migratory patterns and would generally roam high in the skies seeking favourable conditions to land. That would explain how flamingos would land at Larnaca’s salt lake within days of it collecting water. But having an attraction like flamingos comes at a cost. The fact that the biggest flamingo hotspot – the Larnaca Salt Lake – lies in close proximity to Larnaca Airport is a strong remainder that collisions between flamingos and airplanes are a very real threat. "This is still a thorny issue”, continued Hellicar. “A more effective management scheme is needed to tackle this issue. At the moment, the authorities are resorting to scare tactics to remove the birds but this needs to be done more systematically. According to sources, there are around 200 bird strikes every year at Larnaca airport although many incidents are allegedly reported as mere ‘engine problems’. An air collision with a flock of flamingos – with each bird weighing as much as three kilos - could create a nightmare scenario. Another problem is keeping the island’s wetlands hospitable to migratory birds, something which also needs looking into, explained Hellicar. “Cyprus has a duty to preserve areas like wetlands that are classified internationally as priority habitats. There needs to be a careful management plan for looking after wetlands and there isn’t one, unfortunately. In fact, it’s badly run here. Properly managing a wetland means routine inspections of water quantity and quality as well as safeguarding the area and the wildlife dependant on it. “An example of bad management of wetland area is the Paralimni Lake, which is prone to things like poaching, angling and recreational activities. They are disturbing the wildlife such as birds and grass snakes not to mention the pollution being created there."